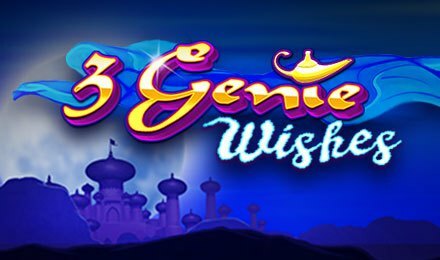 At Wicked Jackpots, you can dive into the world of Aladdin and the Genie by rolling the reels of 3 Genie Wishes slots. Developed by Pragmatic Play, this slot game is made of 5 reels and 50 paylines. The background of this online slot game will bring you into the desert where the lovely reels are placed. You can enjoy this game on either a laptop, a tablet or a mobile phone. As you hit the reels of this online slot, the different symbols you will discover are J, Q, K, A, Genie, Parrot, Jafar, Aladdin, Monkey and Jasmine. Keep an eye on the Genie, which is the wild and pays the top wins. You receive a win on this slot game when combinations of 3 or more similar symbols are formed on any winning lines. Want to watch the reels roll while relaxing? You can make use of the Auto-Play option which lets you pre-select up to 1000 rounds to be played hands free. Bet Levels: On this online slot, there is no Bet Level Tab. Amount of Paylines Selection: The number of paylines are fixed and cannot be altered throughout the game. Coin Values: You can select your preferred bet from £0.50 to £250.00 on the Bet Tab. There is a scatter symbol on this slot machine and it can be seen only on reels 5, 3 or 1. As for the Genie, it is the wild symbol which can replace any other symbols, apart from the scatter. When 3 scatters appear on any position on the reels, you are offered the choice of three bonuses. You have to choose 1 out of them, and you can be awarded any of the 14 available prizes. The various prizes you can win are multipliers, small award, high award or free spins. If you are awarded the free spins round, you are immediately offered 10 free spins to play with. For every rolling free spins, you will find either sticky wilds or raining wilds on the reels. An alternative set of reels is used for this round.